I got all Deep South last night in my Kentucky kitchen, and cooked up a mess of Chicken & Waffles to sooth my savage soul. The 8 and 9-year-old boys in the house found this to be quite amusing. They were perplexed by this dinner option, questioning me on what we were really having. I was told you can’t have chicken, like you know, chicken, which is dinner food – with waffles. Those are for breakfast. Well put, but not true. Kentucky is a border state, and while it has certain Southern sensibilities, they are tempered by its northern neighbors of Indiana, Ohio and Illinois – so a dish like Chicken & Waffles isn’t something you see up this way. Now you don’t have to go much further south to get in the proper neighborhood. Tennessee will do. 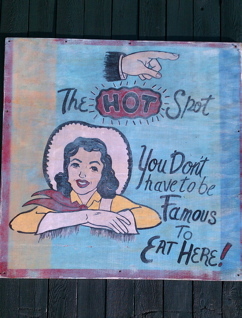 Nashville has plenty of quality spots for Chicken & Waffles; Memphis serves them up as well. This dish emanates from a soul food tradition. There are two camps of thought on how one can go about fixing Chicken & Waffles. The traditional version is basically combining breakfast and dinner. Fried chicken is prepared, along with waffles, including butter and syrup, and you eat it all together. While this may sound odd at first, really, waffles are a heavy breakfast food anyway, and this simply mixes savory with sweet. The version I chose to pursue was a bit more nuanced. Ingredients: 1 tablespoon olive oil; two 4-ounce containers sliced button mushrooms; 2 medium yellow onions, diced; 2 cloves garlic, minced; 1/4 cup white wine; 3/4 cup heavy cream; Salt and ground black pepper; 4 waffles; and 2 pounds of pulled chicken meat. A rotisserie chicken can be substituted if expediency is an issue, but I selected a 6-pound whole chicken, so I could fix this recipe and have a bunch of chicken left over for something else. Here is a look at the finished product. Wash off the chicken and rub lightly with olive oil, smearing a tablespoon of salted butter across its top, then season with onion powder, garlic powder, crushed oregano, smoked paprika, celery salt, season salt and pepper. I also chopped up a whole onion and added it to the bottom of the pan. Place the chicken in the oven for around 80 minutes at 375 degrees (use a thermometer and when the internal temp reaches 180 pull the sucker). Place foil over the top for the first hour, to prevent blackening the skin, then remove foil to crisp it up. For the sauce: In a large skillet heat olive oil over medium-heat; add the onions first and sauté for 5 minutes; then garlic and mushrooms; continue cooking until mushrooms are browned and the pan is nearly dry, around another 5 minutes; pour in the wine and wait for it to evaporate; add the cream and bring to a simmer to reduce; season with salt and pepper and set aside. Once the chicken is about done prep the waffles. Again, you can substitute frozen waffles for ease, but that is sacrilege. I broke out the Hamilton Beach waffle iron we picked up at a yard sale, and mixed the batter from a Hungry Jack Complete (extra light and fluffy) pancake and waffle mix. I brushed vegetable oil on both sides of the iron to minimize sticking, and made up several 4.5″ by 5″ waffles, golden brown, about three minutes each did the trick. In between the waffles cooking, strip the chicken once it has cooled. I rendered all the meat from the legs, wings and a partial breast for this recipe. The legs and wings are bit more flavorful and naturally moist, then some white meat can be added for density purposes. I chopped the meat into roughly bit-sized squares, placed it back into a ceramic bowl, and poured three or four tablespoons of the drippings from the pan over the top and mixed it around. Decrease the oven temp to its lowest setting, cover bowl, and place in oven to keep warm. 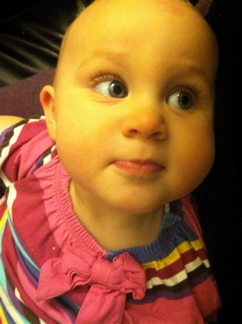 My 11-month old, Isabella, who is nicknamed Waffles, gave this dish her stamp of approval. If too much liquid remains in your sauce, sprinkle in a tablespoon of flour to thicken it up. I also added a bit more wine for my personal taste until I reached a happy consistency. A touch of water can help if it gets too thick as well. Place one waffle on each plate, and top with a heap of warm chicken, then spoon ample mushroom gravy over it all and serve. 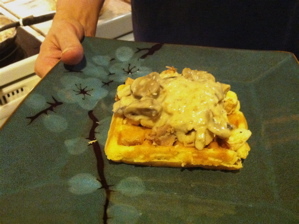 The texture in the waffle is an excellent vehicle for the chicken and gravy. It has a golden crispness that lends a subtle buttery flavor that isn’t too pronounced or heavy. It all mixes together beautifully. If you want some down home comfort food, Chicken & Waffles is just the trick. This entry was posted in Food and tagged chicken and waffles. Bookmark the permalink. That looks absolutely AMAZING and delicious! I like your plates, by the way. I grew up in Amish Country, PA, so Chicken n’ Waffles for me as a kid was pulled chicken, with a…not a brown gravy, but more like maybe a brown gravy with cream? It was almost a darkish beige in color. But it was so good…I haven’t had it in over 15 years (I live in South Jersey now, you should see the looks I get when I talk about Chicken n’ Waffles). Alas, I don’t have a waffle iron at the moment, and I think if I were to try to cram another kitchen appliance into our already bursting home, the Mister would kill me.